Our nut & berry mix is unique. Cheap raisins? Absolutely not. If you like healthy nibbles, you value high nutrient density. Your body will thank you for the boost in high-quality protein, essential fatty acids and vitamins. Except when it comes to quality. Just another trail mix? Not so fast. Our Nuts and Berries mix is super high quality. The perfect combo of sweet nuts and sour fruits. Flavor that’s a treat for your taste buds, vivid colors that’re a treat for your eyes. And a complete nutritional profile that’ll take your body to the next level. Our nuts and berries are certified organic according to the strictest standards. Organic nuts and berries are not only totally free of pesticides. They’re also full of flavor, no additives necessary. What’s more, we just say no to cheap fillers. Why? Because you deserve only the most awesome, authentic flavors and the best possible nutritional profiles. A varied and balanced diet and a healthy lifestyle are essential. Not suitable for people with the following allergies: cashews, almonds, brazil nuts, pistachios, macadamia nuts, walnuts. May contain traces of wheat. Nuts and berries are the perfect snack. A handful of nutsand berries keeps you satisfied, especially in the evenings, and they’re anexcellent energy source post-workout. Due to their relatively high caloricvalues, nuts and berries should be enjoyed in moderation if you’re on a reduced calorie diet. Add 2 – 3 tbsp. of nuts and berries mix to your muesli orporridge in the morning. This makes a delicious, balanced breakfast that’llgive you with the energy you need to start the day. Who should use the nuts & berries mix? Nuts and berries make an excellent healthy snack for athletes and any other health-conscious people. Nuts provide a wide range of nutrients and vital substances and are rich in antioxidants. Nuts also contain valuable omega-3 and omega-6 fatty acids and high-quality proteins. 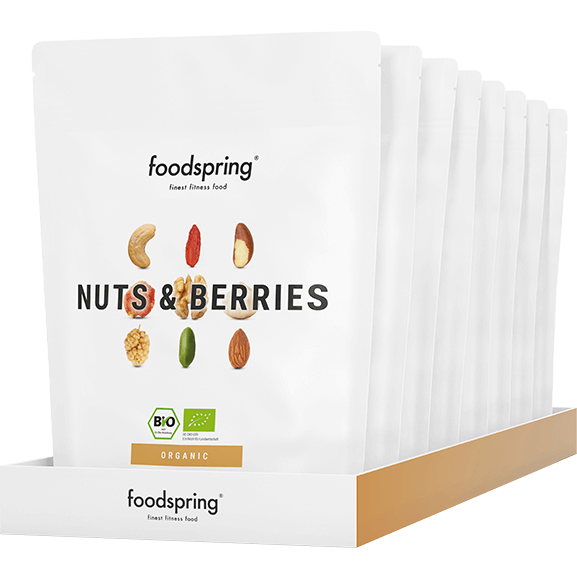 We only select the finest certified organic nuts and berries for our foodspring nuts & berries mix. With a unique combination of green pistachio, cashew, macadamia, almond, brazil nut, walnut along with mulberries, cherries, goji berries and physalis we have created a highly nutritious, premium-quality nut and berry mix. Tart physalis, juicy sweet cherries and aromatic nuts combined with the mild flavour of almonds and exotic Goji berries gives the nuts & berries mix its unique, natural taste. No artificial additives, flavourings or flavour enhancers are added. The mixed nuts and berries are 100% natural. We are particularly proud of the fact that all of the ingredients used in our mix are certified organic. To us certified organic means careful raw material selection and stringent quality standards throughout the production process. This means strict manufacturing guidelines within the framework of German and European food laws. Thanks to transparent partnerships with our raw material suppliers, we can trace every single shipment to its place of origin, ensuring that each individual product is of a consistently high quality. By using exclusive organic raw materials we can guarantee that no chemical fertilizers are used on our foods and that they are not subject to irradiation. Exclusive selection of nuts including pistachios, cashews, Brazil nuts, etc. What makes our nut and berry mix so special? Nuts and berries are extremely rich in nutrients and contain numerous vitamins and minerals, trace elements and antioxidants. They also serve as a valuable source of healthy omega-3 and omega-6 fatty acids and high-quality protein. Here is an exclusive overview of the of the individual ingredients in our nut and berry mix. In terms of mineral content and vitamin density, the sour cherries in our berry mix beat fruits like apple, which ordinarily found in berry mixes, hands down. They are also very rich in potassium which causes them to have a dehydrating effect. But phytochemicals are the cherry's special feature. Cherries are rich in so-called polyphenols, which also gives them their characteristic red colour. Phytochemicals have an antioxidant effect and combat free radicals in our body as well as supporting the digestion process. The visually appealing physalis fruit is an excellent source of vitamin C, phosphorus and beta-carotene. Phosphorus plays a particularly important role in the formation of bones and teeth. Physalis also has a high protein content. Physalis is packed full of so-called pectins. According to scientific studies, these play a role in cholesterol regulation. "Undesirable" LDL cholesterol in particular can be reduced by the power fruit. The bioflavonoids (phytochemical) in physalis ensure a higher bioavailability of vitamin C and in turn help prevent oxidation. This veritable superberry is rich in antioxidants, minerals and vitamins. It also is an excellent source of vegetable protein, which is essential for a healthy diet. Thanks to their high vitamin C content, mulberries are useful for aiding the immune system in fighting free radicals and regulating blood pressure. Another component in the berry mix is the Chinese goji berry. These are rich in iron and vitamins A, B and C. An iron deficiency is one of the most common mineral deficiencies. Signs of a deficiency include impaired performance and concentration as well as frequent fatigue. Goji berries also contain antioxidants. Pistachios are rich in vitamin E. This vitamin plays an important role in fighting free radicals in the body and supporting the immune system. Pistachios also have a high potassium content. Potassium helps replenish glycogen stores after exercise. Walnuts are an excellent source of melatonin. This has an antioxidant effect. Walnuts also contain a significant amount of omega-3 fatty acids. These are important for normal cell functions and the body's natural balance. Vitamin B6 and zinc complete the action spectrum and have a positive effect on the transport of nutrients and an intact immune system. Zinc plays a part in more than 200 enzymatic processes in our body. A large amount of the trace element selenium can be found in Brazil nuts. Selenium helps remove free radicals and heavy metals from the body. It also plays a role in the function of the thyroid gland. The range of minerals; phosphorus, magnesium and calcium is also essential for healthy growth and normal bone function. 80% of the calories contained in the macadamia nut are made up of unsaturated fatty acids. These "good" fats help maintain a healthy heart and circulatory system, as proved by various studies. One study showed that consuming just 10 macadamia nuts a day can reduce cholesterol levels in the long term. Too much cholesterol can eventually lead to cardiovascular diseases. Macadamia nuts also contain a high proportion of the amino acid L-arginine. This ensures improved nutrient transport during physical exercise and can have a positive effect on strength and endurance. Cashews are a valuable source of minerals. More than anything, they are high in magnesium and B vitamins which, among other things, take care of energy production and muscle contraction during physical exertion. Improved concentration and performance can also be attributed to the consumption of cashew nuts. Almonds contain large amounts of calcium, magnesium and folic acid. They are also particularly rich in monounsaturated and polyunsaturated fatty acids. The nut & berry mix is the perfect nutritious snack for work and travel. As a source of high-quality protein and fat it provides immediate energy and has a positive effect on performance. The perfect aid for a healthy everyday life. In terms of building muscle, the nuts & berries mix is a high-calorie snack, perfect for helping you reach your daily calorie surplus. Thanks to the high nutrient density 500-600 quality calories can be found in just 100 grams of the mixture. The nuts & berries mix is ideal for the health-conscious and athletes who are looking for a healthy, certified organic snack of premium quality. The snack is also designed for anyone who loves nuts and berries and prefers a natural taste experience without additives. High-quality nut and berry mixtures can be distinguished by a lack of artificial additives, flavourings and flavour enhancers. Premium products are 100% natural, contain no added salt and are not subject to sulphuring or irradiation. Many fruit and nut mixes include inexpensive raw materials like raisins, grapes and peanuts. In terms of nutrient density and quality, these materials cannot compete with their high-quality counterparts, like physalis, goji berries, macadamias and Brazil nuts. What's more, few suppliers on the market can claim to use nuts and berries of 100% organic origin. Only certified organic raw materials are a guarantee that no chemical fertilisers or synthetic additives are used during the cultivation process. The organic label represents maximised transparency and strict guidelines for the manufacturing and production processes. You can buy 100% certified organic nuts & berries with top ingredients right here in our online shop. What is an organic quality nut and berry mix? The 100% organic nut and berry mix guarantees natural production methods with no irradiation or use of chemical additives. Organic quality also ensures the nuts and berries have maximum nutritional content. Isn't this just a classic trail mix? A classic trail mix often contains large quantities of inferior ingredients.These mixes are often processed with artificial additives, added salt or sweeteners. Through our unique combination of exclusive 100% natural nuts and berries, we strive to provide you with a completely different product and want to set new standards in the world of nuts and berries. Why should I pay 5 euros for a nut berry mix? Simply because these are the best nuts and berries you can find in one product. We don’t use cheap fillers like raisins, we only use the most nutritious and exclusive raw ingredients, such as the most expensive pistachios in the world, from Iran. Or the most luxurious nut, the macadamia. Why is the macadamia considered to be the best nut? It is nutritious and buttery soft. On the outside, it resembles a chestnut. In Germany, it is known as the “king of nuts.” The macadamia’s huge popularity comes at a price. It is actually the most expensive nut in the world as cultivation and processing is very labour-intensive. The shell is so hard that not even a nut cracker can open it. The nut definitely brings added value to our mix. What is so special about Iranian pistachios? Originally pistachios came from Persia and Afghanistan or present-day Iran. Pistachios were being cultivated there as early as the 2nd century B.C. The region’s climatic and geographical conditions are so perfect that we can confidently say that pistachios from Iran are the best you can buy. What is a Brazil nut? In Germany, the Brazil nut doesn't enjoy the reputation it deserves. We think that’s a shame. The Brazil nut conteins the trace element selenium. Your cells need this trace element in order to combat free radicals. You will quickly discover that the Brazil nut not only tastes great but is also a nutritional delicacy. And don’t forget about the Brazil nut effect. This refers to the phenomenon of how when a pack is shaken, the largest items always end up on top. So when you shake the Nut and berry mix, you are sure to find a Brazil nut right at the top. Nuts and Berries Mix 8 pack will be back in stock shortly.